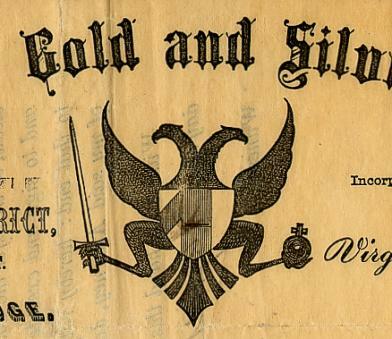 Beautiful RARE certificate from the Double Eagle Gold and Silver Mining Company issued in 1863. This historic document was printed by Towne & Bacon and has an ornate border around it with a vignette of a double eagle. This item has the signatures of the Company's President, L. H. Atchinen and Secretary, W. E. F. Deal and is over 144 years old. The certificate was issued to C. E. DeLong and was endorsed by him on the verso. Double Eagle Gold & Silver Mining Co. was Incorporated in 1863. The mining property was located in the Virginia District, Storey County in the Nevada Territory at the Russian Empire Ledge.